Win a copy of Phoebe Smith's guide book to "Britain's Best Small Hills"
Award-winning travel writer Phoebe Smith returns with more great outdoor experiences tailored not just for the hard-core wilderness enthusiast but for novices and newbie hillwalkers alike. There are 60 hill walks detailed in this easy-to-follow guide from just 120 metres to a manageable 609 metres, and from Cornwall to the Scottish Highlands. "When it comes to mountains society seems to be obsessed with height. But those who shun peaks based on measurement are truly missing out. Following on from the success of Wilderness Weekends, people are always asking me where they can take a friend, partner or young child that will help convince them that the outdoors - and hills - are worth the effort. Answering that need is this book, it's all about minimum effort for maximum results." Phoebe Smith has been exploring Britain's mountain's extensively and has written about them in a range of magazines and newspapers in the UK, USA, Canada and Australia as well as being the author of 7 books - all on the British wilderness and the joys of camping. Win yourself a copy and be inspired to enjoy Britain's countryside and its small hills. In her book Phoebe Smith looks at 60 of her favourite small hills in Britain. On our West Mendip Explorer walking holiday in Somerset you can walk to the highest point on the Mendip hills This summit, which is the site of bronze age round barrows, is known by what name? Bradt Travel Guides is offering High Point Holidays subscribers a special 20% discount on copies of Britain’s Best Small Hills. 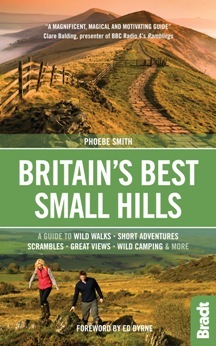 To claim your discount, please purchase via the Bradt website (http://www.bradtguides.com/shop) and enter code SMALLHILLS at checkout.